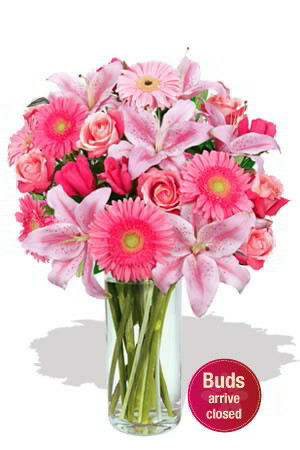 Pretty pink roses, vivacious pink Gerberas and splendid pink Oriental Lilies are united to create this beautiful bouquet that is sure to enchant your special someone to bring about the magic, warm feeling of love and romance.Vase not included.If you wish to make a fantastic impression, may we suggest that you add the Premium Box of Chocolates to Enchant Me and let your special someone take pleasure of enriching all the senses, sight, touch, smell and taste! Thank you zFlowers - easy to use website, prompt delivery (as promised), great range of flowers ... but best of all, beautiful flowers. My daughter loved them. Thank you. The first time I clicked the buy button nothing happened, so I clicked it again the order went through. I emailed to make sure only a single order was received and Jessah responded very quickly that he only saw the single order. They did all that I asked, except the balloon was not blown up. Flowers came in a box with wine and balloon, so maybe acceptable. The recipient was not home when the flowers arrived. However, she was contact by phone and advised of the delivery. That was appreciated. 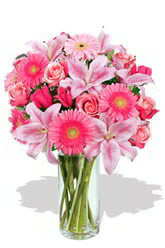 Delivered on a Sat promptly and the flowers were as beautiful as the advertised picture. My daughter can't stop raving about them. Very happy and will definitely use you again and recommend to friends.